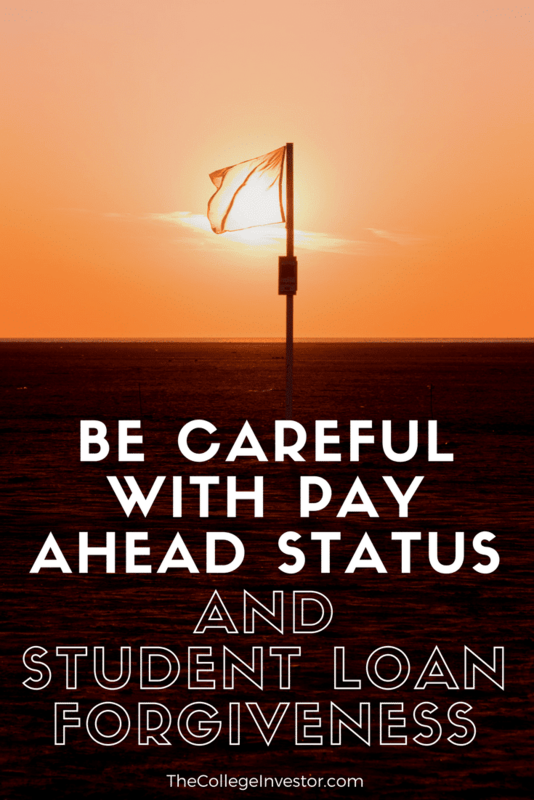 Today I want to share a scary reminder about why it's so important to be diligent and accurate when it comes to making payments on your student loans - especially if you're planning on applying for a student loan forgiveness program such as Public Service Lo﻿﻿an Forgiveness. How Does Pay Ahead Status Work? ​If you have a Federal student loan, and you pay more than the minimum due, that extra payment is applied to your next payment. This is called "Pay Ahead Status". ​The rules are the same for all Federal student loan servicers, because Federal loan rules are dictated by Congress and the Department of Education. When you pay extra, your payment is applied in the same way every time: Fees > Interest > Principal. The only thing you and your servicer can control is how your extra payment changes the due date of your next regular payment. By default, extra payments push that due date forward. Your payment is applied the same no matter what, and by letting the due date roll forward, you just build yourself a cushion of time when you don't HAVE to pay. You might never need it, but a month or two of no payments could come in handy if you have a personal emergency. How Does Pay Ahead Status Impact Student Loan Forgiveness​? That doesn't sound too bad, right? Well, what if you're planning on applying for student loan forgiveness on a program like PSLF?​ Here's where the real problems start. For PSLF purposes, a qualifying payment means a full payment based on your repayment plan amount. If you don't make a full payment, that payment won't count as qualifying. And here's where Pay Ahead Status causes problems. Let's say your full payment amount is $150. If you pay $200 one month - that payment counts. However, the next month, your invoice amount will reduce to $100. If you only pay the $100, your payment will not qualify since you didn't pay at least $100. But you weren't supposed to have to pay $150 because you were in Pay Ahead Status! This is where Pay Ahead Causes real problems. Another example, from a reader. His monthly payment each month was required to be $172.56. However, he simply rounded up his payment to $173. However, that reduced his next ​payment to $172.12. This month, his wife simply pays the exact amount because she's not as OCD as her husband is. However, that payment doesn't qualify for PSLF because it's not a full payment - even though the loan servicer considers it a full payment. If you find yourself in this situation, know that the Department of Education is looking at the problem, and most loan servicers are aware of it. However, given the loan servicers don't have an incentive to resolve it, you'll be challenged to get it fixed. We've found the following steps to be helpful (although still a struggle) to get any payments in Pay Ahead Status to qualify. In the situation above, it took our reader about 6 months to get a resolution from Fedloan Servicing. ​ They eventually allowed all the pay ahead payments he made to count towards PSLF. Step 1. Contact Your Lender And Remove Pay Ahead Status: If you find yourself in pay ahead status, get it removed immediately. Then, ask them to make any payments count towards PSLF. If you've already filed your certification paperwork for PSLF, your loan will typically be serviced by Fedloan Servicing. They should help you with this process. Step 2. Speak To A Fedloan Borrower Servicing Advocate: If you're not getting anywhere with the phone rep, you need to ask to be transferred to a borrower servicing advocate. These are better trained individuals who can help get the situation resolved. Step 3. Speak To PHEAA Consumer Borrower Advocate: If you still can't get anywhere with FedLoan, you can contact their parent company PHEAA and speak to a consumer borrower advocate. PHEAA directly has a contract with the Department of Education for the loan servicing, so they may be able to better assist you. Step 4. Contact The Department Of Education Student Loan Ombudsman. The Department of Education maintains an Ombudsman program designed to help borrowers struggling with their loan servicers. The challenging part is that many Ombudsman fuctions have been outsourced to a third-party company as well, but they are still a good resource to speak to and ensure they have documentation of the issue. If you're still struggling to get answers, it could also make sense to speak to a student loan lawyer regarding your situation. ​Given that the value of loan forgiveness can be high, it might be worth paying a lawyer yo help you get this resolved. Make sure you find a lawyer that is an expert in student loan debt issues. Deborah I am going through the same things but I keep calling and wrote letters. Finally got them to say I have enough. If you have bank statements this could prove your payments. Payments must be for exact amount, not late, work in public for ten years and still work there. Cannot leave position or won’t pay. Can’t retire when I want to. I have to wait until this is up or I will lose this. They screwed up mine when I initially started. Fedloan took over the loan from Nelnet, without given me notice beforehand that I was approved to participate. Nelnet didn’t even know. I found out they had it when I went to make my regular payments on Nelnet and Nelnet researched it. I lost a lot of money paying ahead, because I was told by Fedloan representative that it was okay and it wouldn’t affect my qualifying payments. Long story short, those representatives was misinforming me and as a result my loan debt balance jumped up with no qualifying payments. After making several complaints, all I got out of it is sorry from their supervisor and that they will fix it on their end to change if from pay ahead, which I never opted in on. (it was done from their side, because I was always paying ahead with Nelnet before Fedloan took over). US Department of Education doesn’t care about this. They did nothing, but complicated it with more confusing information that Fedloan couldn’t explain. If you believe there is an error, based on what you said, you may consider speaking to an attorney that specializes in student loan debt.